Union City Lions Club President Joe Wyant (left) is pictured with Jeff Gard, who gave a donation to the club. UNION CITY, Ind. 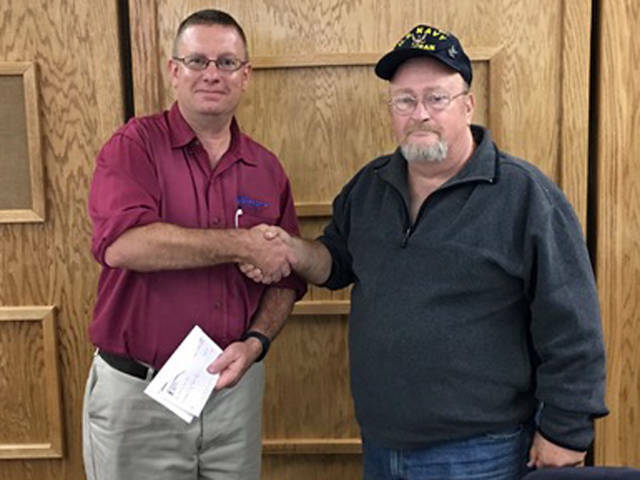 – Robert “Jeff” Gard presented a donation to the Union City Lions Club on behalf of the family of the late Bob Gard. A memorial golf outing was held at the Winchester Golf Course on Sept. 29. Half of the proceeds went to the Union City Lions Club of which Bob was a member. A total of 22 teams participated in this nine-hole scramble. Organizers of the event were Mike Grim, Jeff Gard, Ed Farmer and Larry Carpenter.